A real hero knows how to rise to the occasion.Dennis is a college student whose only luck with the ladies is ogling them from afar and picking up their misplaced bikini tops the morning after wild pool parties he never attends. After working late nights at Conan's Pizza, his overactive Frazetta-inspired imagination are all that get him through the day.Dreams of slaying beasts to rescue babelicious women will soon be put to the test as his sudden gut-emptying illness turns out to be the side effects of desperate priestess magic from a world of savage-land hotties and nightmarish monsters.With his newly bestowed herculean body and the aid, advice, and welcome attentions of his female companions, Dennis must learn the skills of a warrior, gain the heart of a champion, and fulfill the uniquely different desires of the women who choose to call him their man.Facing deadly vagabonds, ravenous beasts, and mythical creatures, he does his best to survive the challenges of this new land and protect the women relying on him. 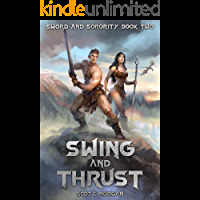 But his hard work in college never prepared him for any of this, and especially not for the Dark One.Warning: This novel contains explicit content, and is not meant for readers under 18 years of age. 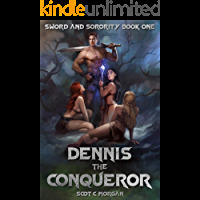 A hero has risen but is his sword ready for what lies ahead?Dennis rides onward toward his destiny, manning up for his quest to rescue all the college babes in peril he can find.With his women by his side, he sets upon a journey to the strange lands of the north, hoping to chase down a rumored lost hottie from back home and gain knowledge and allies he'll need when his time to face the Dark One comes.But the horseback road trip is anything but an easy ride through the countryside, when vagabonds, lurking monsters, and dark sorcerers with sinister plans rise from the shadows to threaten him and the lives of the women he's sworn to protect.Can he swing his mighty sword enough to thrust his way ever closer to destiny, or will the wilds of Galderia and the forces of darkness prove too much for him?Warning: This novel contains explicit content, and is not meant for readers under 18 years of age.